It’s everybody’s favorite sale of the season! Time to stock up on rusted metal planters, wall art, magnetic frames, your favorite SWAPs, and so much more! Thursday through Sunday, take 20% off ALL Prairie Dance metal art. 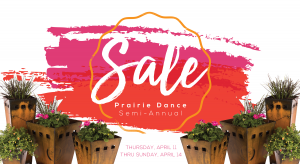 New, best-loved, clearance—the entire Prairie Dance collection is on sale! Shop in-store or online! Online shoppers use promo code “SPRING19”.